Since I'm in the Chicago marathon today, it seemed like a prime opportunity to run (heh heh) a review of Boaz Yakin's and Joe Infurnari's graphic novel, Marathon, telling the story of the original run that inspired the race. The basic story is that the Persians are coming to attack Athens. The messenger Eucles is sent to Sparta to ask for help. When they decline, citing a religious celebration, Eucles then runs back to Athens, picks up a sword and fights along his brethren at the coastal city of Marathon. The Athenians manage to drive the Persians back to their ships, but they soon realize that the Persians are now heading directly to Athens, currently unguarded. Eucles is then tapped to race back to Athens to warn them of the impending attack. He arrives in time, and the remaining Athenians (primarily the elderly, women, and children) manage to trick the Persian fleet into thinking they are all well-armed soldiers. The Persians sail away, defeated, but Eucles is only able to revel in his achievements for a few moments before his dying breath. The legend dates back to 490 BC. Herodotus, writing a few decades later, did talk of a runner named Pheidippides who made the Athens-Sparta run (around 150 miles) in two days. He made no mention of the subsequent Marathon-Athens run (another 26 miles). The first mention of the Marathon-Athens run doesn't occur until Plutarch writes about it about 400-some years after Herodotus, and the hero of Plutarch's story is a man named Eukles. While there's enough corroborating evidence to suggest Pheidippides was a real person, Eukles is a bit more suspect and combining his story with Pheidippides' definitely amounts to a work of fiction. It makes for a fantastic story, but it's more fiction than fact. Which means that, yes, today I'm running 26.2 miles because somebody once told a story about how cool this fictional Eukles guy was. But back to the Yakin/Infurnari book! I think one of the things that Americans here in the 21st century have trouble understanding is the deep sense of "nationalism" that was cultivated in ancient Greek city-states. The sense of being Athenian (or Spartan or whatever) was often paramount over any other sense of identity. To mitigate that possible disconnect, Yakin smartly adds something of an "origin" for Eucles to make the later Persian attack a very personal one. There's also some set-up to make Eucles' achievements more emotional than physical; yes, the man's endurance and determination is laudable on its own merits, but he gets more satisfaction from winning over the respect of former childhood adversaries. The story is also built up so it's not JUST about Eucles. He's certainly the lead character here, but there's some interesting things going on with Hippias (the primary antagonist) and Philon (his son and second in command), not to mention a little with the side characters. For as simple and straightforward as the original tale is, this adds some nice texture to it. There's also a bit from the legends that say Pheidippides met Pan on his Athens-Sparta run, and Pan later helped at Marathon by inciting a sort of blind panic among the invading Persians. In the book, though, things are kept decidedly more mortal. Eucles, exhausted and dehydrated, thinks he sees Pan about halfway on his trip to Marathon but it turns out to be only a goat that inadvertently shows him to water and a shortcut. And instead of Pan, it is Eucles who helps to raise a sense of fear among the Persians by setting an inspiring pace for the Athenians. Infurnari's art is pretty solid. There's a sketchy quality to his line, which helps to emphasize Eucles' almost constant state of motion. Most of the book is printed with a sepia tone look, and there's an interesting change-up by making the flashbacks in black and white. There were a few scenes that got a little harder to follow since all the soldiers were wearing the same uniform, which included face-covering helmets. Historically, pretty accurate, I think, but it made some of the fight scenes a bit more difficult to follow. That said, I would've liked to have seen the book printed at a slightly larger physical size. I would like to be able to see some more of the detail that Infurnati put in, and I think some of that gets lost here. It's a comfortable size to hold currently, but I guess you have to weigh how much you want to study the art versus how comfortable it is to read on a train. I have to admit to having a difficult time following the specifics of the battle plans as well. I'm sure this is in part because I'm rubbish with military strategy in the first place, and in part because I was reading the book at 6:30 in the morning. But it wasn't until almost the very end of the book that I figured out why the Persians weren't going to Athens in the first place, and why the Athenians met them in Marathon, and what the hell does Sparta have to do with any of this anyway? I don't know that following that all is critical to one's perception of the story, as long as you get that you're supposed to root for Eucles and whatever side he's on. The story mostly follows him after all. All in all, a good book. 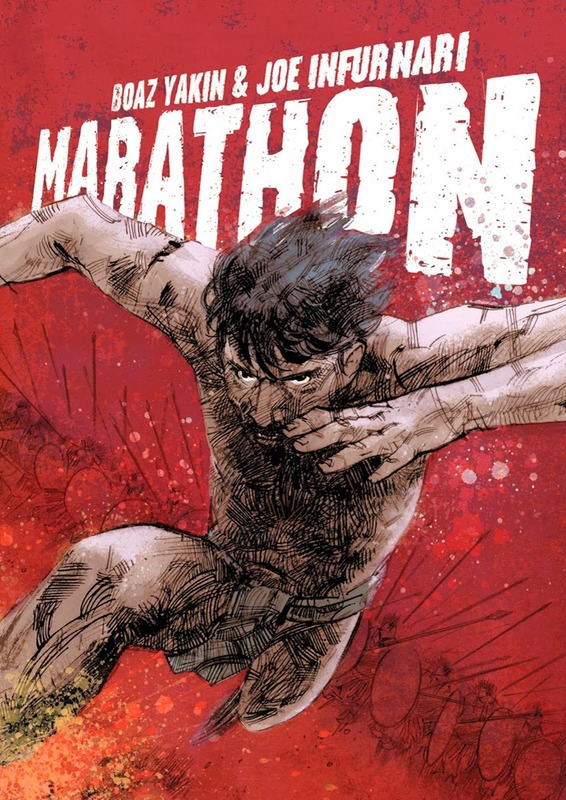 Not to mention that it tells an excellent story that can provide a little historical background when you run into crazy people like myself who will run 26 miles even when they're not being chased by a platoon of Persian soldiers! And for those of you who run marathons yourself, it's a good perspective on how you're getting off easy compared to the guy who made that first run!